“The only ethical decision is to take responsibility for our own existence and that of our children. A permaculture garden is designed by deriving inspiration from natural forms. It serves not only an aesthetic, but also a practical purpose – the border areas hold the highest plant diversity, the garden beds provide for variety of conditions (the sun, wind, moisture) and increase the number of plants which can be planted. Photo: from Marcus Polz personal archive. The term ‘permaculture‘ is derived from the word combination ‘permanent culture’. Although mostly used to refer to sustainable agriculture or sustainable management of a household, permaculture is not only an assemblage of practical knowledge. It is a source of theoretical and philosophical principles and resources, covering one’s lifestyle, way of thinking and serving as a basis for one’s actions. Permaculture views nature as a single unit or ecosystem, which can be complemented with another ecosystem – a permaculture garden, which also functions according to the nature principles. The permaculture garden, thus, is the result of careful long-term observation. It is interesting to note that the notion ‘permaculture garden’ is commonly used by permaculture practitioners to denote not only the creation of a nature-friendly and productive garden, but also the construction of energy-efficient houses, economical and functional placement of subsidiary buildings and even the closest surroundings of the property. The permaculture garden is, indeed, divided into several zones according to how often there is a need to visit each zone daily. The observation of this principle ensures the efficient use ot the territory, as well as economy of natural and human resources. Zone 00 is the person himself/herself (the inner harmony and relationship with others). Zone 0 is a sustainably designed house in the construction of which the sun light and the prevailing winds, as well as other factors important to the owner are taken into account. The first zone is the closest zone to the house. Permaculture garden elements which need our daily care and attention (for example, the chicken coop and the greenhouse) or which are used every day (the herb spiral and the compost) are located here. The second zone includes the orchard, provides space for chickens and ducks to wander around and serves as home for other small animals. The third zone comprises the area of the property which is used to gain income. It includes barns, pastures for cattle, fish ponds and grain fields. Only the farms which practise cattle-breeding, fish farming or cultivate grain have the third zone. The fourth zone includes forests which provide timber and firewood. The fifth zone is one of the most important ones. It is a territory of our property where we deliberately choose to ‘do nothing’, or leave nature intact. The sixth zone extends beyond the borders of our property. It is an area which we visit often, for example, a lake or a river where we like to swim or a forest where we go to gather mushrooms or berries. Regardless of the size of the property, there will always be zones 00, 0, 1, 2, and 5. All zones are interrelated, and each permaculture element (anything that is built in accordance with permaculture principles – a house, compost, a herb spiral, the raised garden beds, a greenhouse into the ground (‘walipini’), a solar dryer, a bench on which to sit on and so on) is multifunctional and is in a set place for a number of reasons. For example, the chicken coop, which is located close to the house, produces heat, which helps to heat the house and is easy to maintain. Chickens walking in the nearby greenhouse raise dust, which settles on the leaves of the plants and serves as a good fertilier. Because of this principle permaculture is often reffered to as a farming method for lazy farmers. Admittedly, there is truth in saying so – a well designed permaculture garden functions as an independent ecosystem, demanding minimal effort to maintain it. A plan of permaculture garden design and its division into zones. 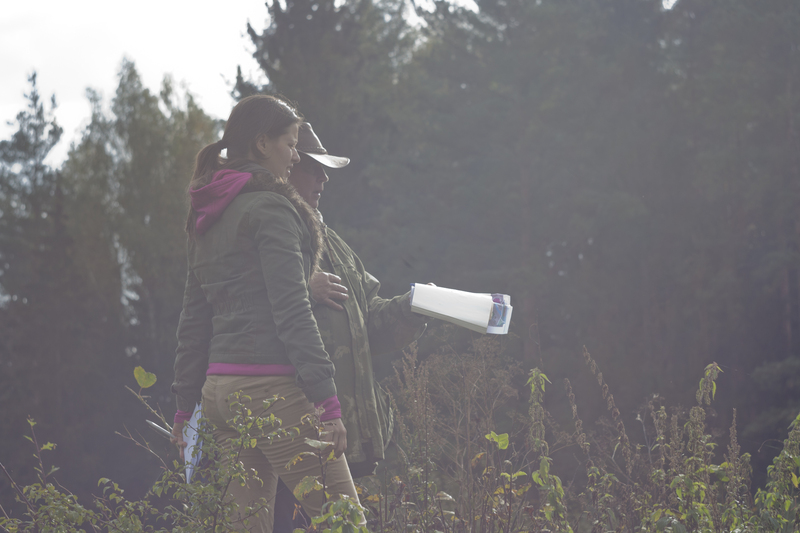 Photo: Agnese Tukane, permaculture garden planning at ‘Inki’, September 2016. However, it is clear that a thriving permaculture garden requires thorough knowledge and significant amount of work invested in nature observation, identification of the external factors (the sun, wind, fire, water, wildlife, noise, dust), appropriate permaculture element placement and long-term planning. This does not mean that the permaculture garden as soon as it is completed will not change, on the contrary – it is still perceived as a living and changing eco-system which will evolve over time. The essential difference lies in the fact that permaculture elements are not arranged chaotically – doing and thinking at the same time. Rather a significant amount of time is devoted to the planning process. Observe your property through the seasons, paying attention to such aspects as the air temperature and its fluctuations, the location of the property and buildings in relation to the cardinal points, the sun, the wind, the quality and characteristics of the soil, wild plants growing in certain areas, etc. Notice areas with the most sunlight, the strongest wind, wet and dry soil, etc. Certified permaculture designers can provide you with a complete list of questions. Permaculture garden planning is referred to as the garden design. The designing takes place by finding the most successful placement of the permaculture elements, taking into account the size of the property and the needs and wishes of the owner. It is only after the previous steps have been carried out that the project implementation can be started. They ensure that the property will truly meet permaculture principles: will be easy to maintain and energy-efficient, and will contribute to the diversity of the plans and the surounding nature. Permaculture garden design is based on long-term observations. 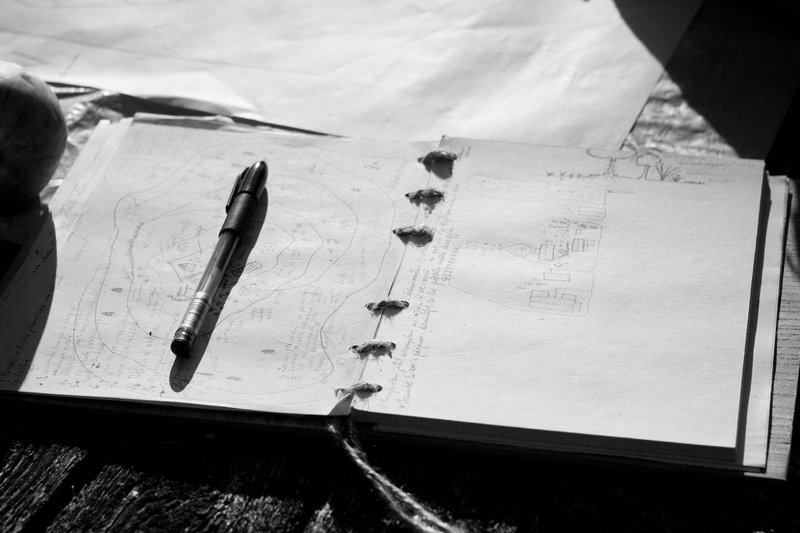 Photo: Agnese Tukane, permaculture garden planning at ‘Inki’, September 2016.. It must also be stated that permaculture is nothing new and unprecedented. The knowledge about the compatibility of plants, the location of the buildings and the garden in relation to the cardinal points, the favourable days of sowing and planting according to the lunar calendar, plants growing in the sun or in the shade, etc. is still alive in most of Latvian farms. Permaculture systematises this knowledge and complements it in a way which benefits humans, nature and society. The latter three also serve as the basis for the following three permaculture ethical principles. When planning a permaculture garden, the care for the planet, the efficient use of resources, the soil and the beings living in it is always put in the first place. Not to interfere in their life and not to cause harm, digging is kept to a minimum. Instead, mulch is often used. People care means caring for one’s family, neighbours and the society in general. Are there buildings or equipment you could share with your neighbours? The benefit will be economically viable to all parties, and consuming fewer resources is environmentally-friendly. Moreover, it will also encourage communication and hopefully lead to other forms of cooperation among people. Efficiently designed permaculture gardens are very productive. The harvest is even likely to exceed the needs of one family or a community. By sharing it others get the possibility of using organic food and seeing your example, you might develop cooperation and get economic benefit, and altogether this serves the planet. These ethical principles are respected when planning anything new in the permaculture garden. In any of the principles is not met, the project is not being realised. Permaculture is not only a set of scientific techniques and principles, but also a philosophy. It changes the mindset from individual to collective and helps to move from being a consumer to a self-sufficient producer and from someone who is blaming the whole world to a responsible person who is ready to take action. It is a way in which an increasing number of people both in Latvia and abroad show their love and care for nature and the preservation of natural diversity. Permaculture is an action-oriented response to today’s global environmental situation. Permaculture teaches us to observe, keep an open mind, learn, plan, develop, think long-term and look for creative solutions. It is a deliberate method based on human relations and cooperation as opposed to the current era of technologies, fast solutions and, in a sense, alienation. However, permaculture is not only a privilege of countryside farm owners. Permaculture projects are being developed in cities (such as roof gardens, vertical gardens), allotments, mountainous areas thousands of meters above the sea level and even deserts. Even if you do not own a property with a sufficient space for a permaculture garden, nature patterns and principles can be applied in the planning of a house, a residential area, the construction of buildings and, ultimately, your lifestyle. Permaculture is truly a lifestyle. A lifestyle for those willing to cooperate both with nature and others. They receive back much more than their investment – great satisfaction and a change in the perception of life.